Being on a staycation has done wonders for my productivity in the sewing room - and the really unpleasant weather we've been having isn't hurting either. 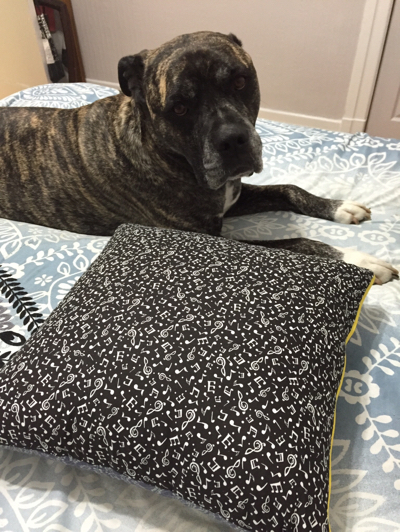 This week, I finished the two pillows I was working on last week (I talked about them in my WIP Wednesday post). Both pillows are 18" - a really nice size for my queen size bed. 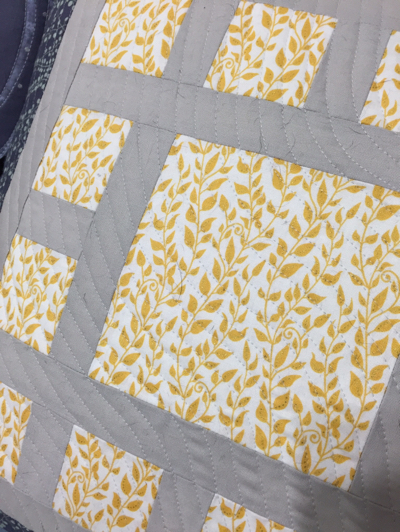 I quilted this one in the ditch around the black part and then traced the beautiful foliage in the fabric with my FMQ foot - something I had yet to try. I am very pleased with the results too. 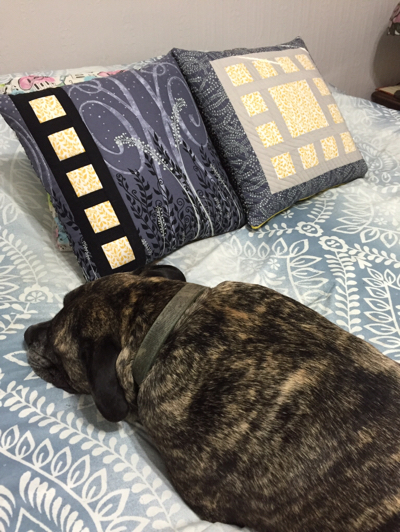 I used the same yellow print so the pillows match but because the design is so different, they aren't too matchy-matchy. 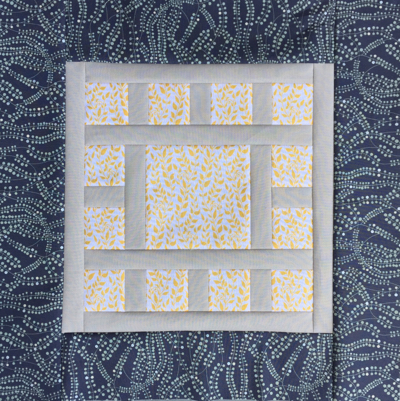 I quilted this one with my walking foot. 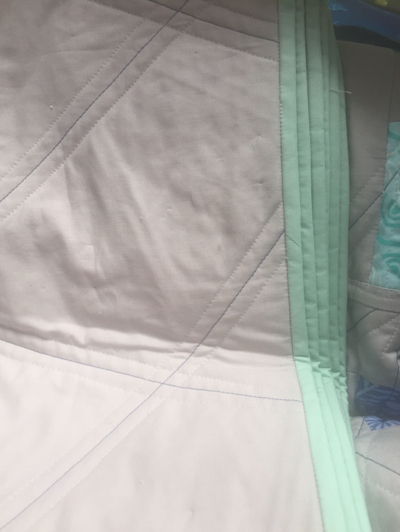 I first quilted a wavy line from the bottom right corner to the top left and then echoed the line about 1/2" apart, using my walking foot as a guide. 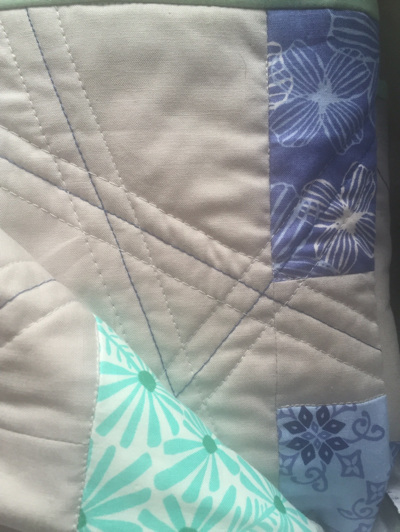 I really like the texture this quilting gives the pillow. 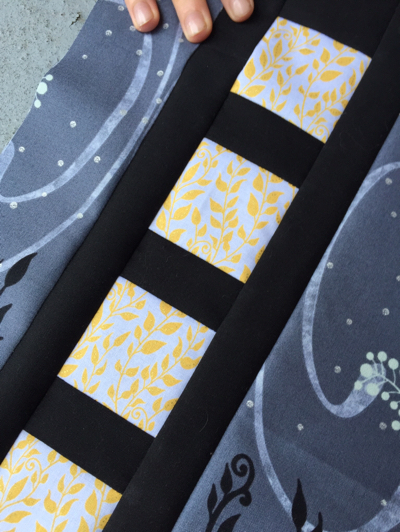 For the back of each pillow, I used a musical print I've had in my sewing room for a long time and closed each pillow with a nice yellow zipper. 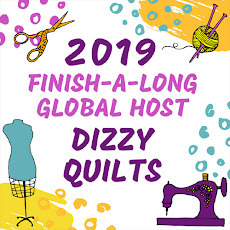 I will be linking this finish up at Quilt Matters where MR is hosting TGIFF this week and at Amanda Jean's for Finish It Up Friday. A few years ago, I gave my sweetie guitar lessons for his birthday. He has since acquired a number of guitars and has been entertaining us with his playing every chance he gets. When I got the Summer 2014 edition of Modern Quilts Unlimited, and saw a guitar quilt pattern, I immediately identified it as something I would need to make for my sweetie. 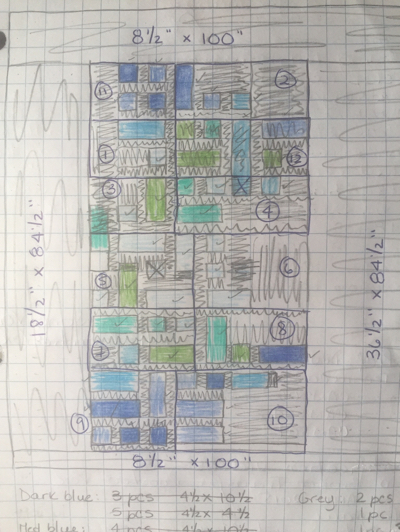 Each square is 2" finished. 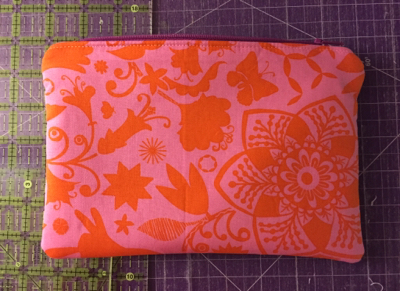 I didn't really feel like spending hours cutting 2.5" squares so decided to use up the mini charms I had in my sewing room and which I knew I probably wouldn't use otherwise. I chose 6 packs that are more traditional prints and colours - and let's be honest - I just wasn't crazy about. But I figured they would be ok to use in a quilt design such as this one. 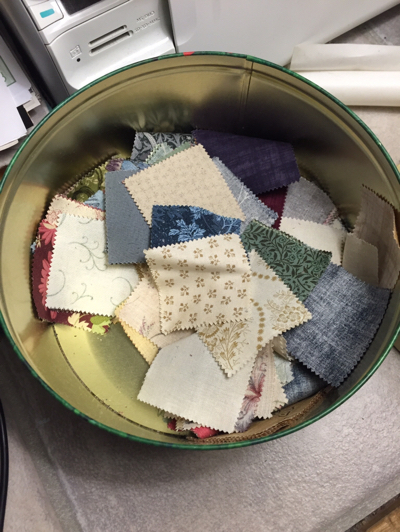 I pulled the packs apart and put all the little squares in a cookie box I had handy so that I would simply pull them out of the box and sew. I'm using Kona Snow as the background so might have to eliminate some of those mini charms. I worked on this all day yesterday - it was pouring rain - and made some really good progress. But I'm running out of Kona Snow real fast so will most likely need to order more before I can finish this top. 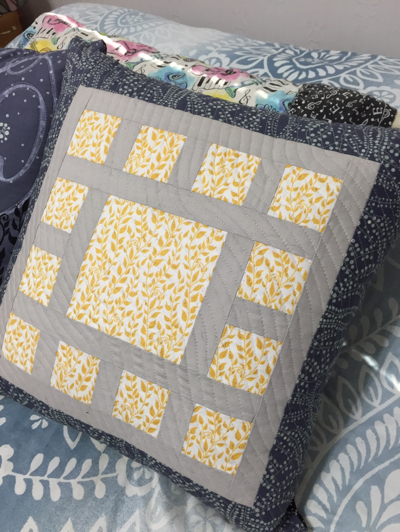 Ever since I took the FMQ workshop with MR from Quilt Matters and she showed us how to assemble our quilted blocks using a quilt-as-you-go method, I've been wanting to make a big bed quilt using the same technique. 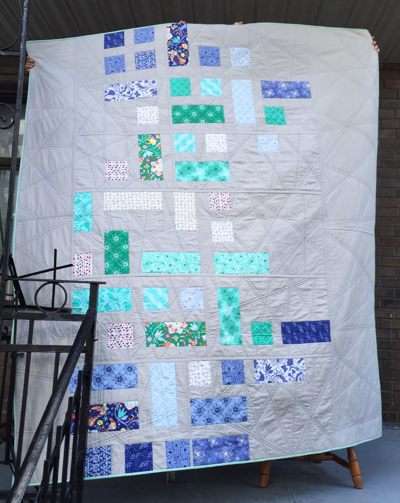 I've quilted big bed quilts on my domestic machine, but I have to say my shoulders weren't happy about it - quilting small sections of a quilt and then assembling the quilted blocks seemed so much easier to me. 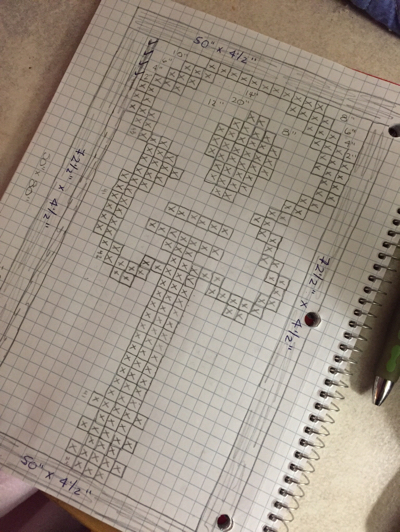 I saw a picture online a few months ago of a quilt (of course I can't find it again now) but there was no pattern and no tutorial, so I got out my graph paper book and started drawing. Within a couple of hours, I had a design I really liked and vaguely resembled that picture. 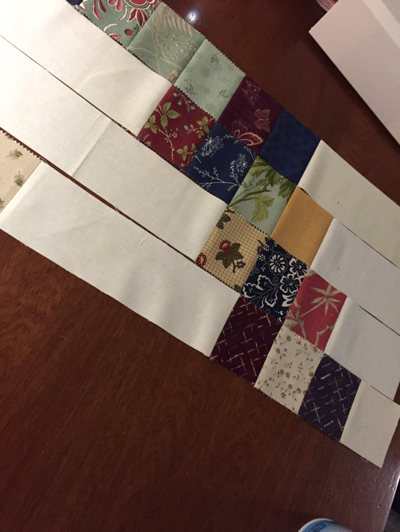 The tricky thing was making sure I could "cut" the design into sections that would result in rows or columns that could be sewn together after they were quilted. 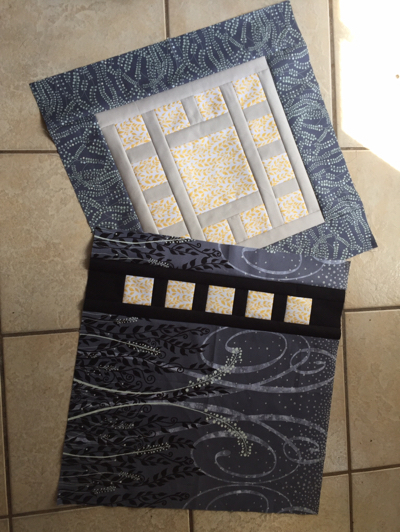 I then did the math, cut the fabric for each section, pieced each section and then quilted it. I used Kona Ash for the background and a bundle of Kate Spain's Daydream for the coloured blocks. I used my Hera marker and randomly traced straight lines for the quilting. 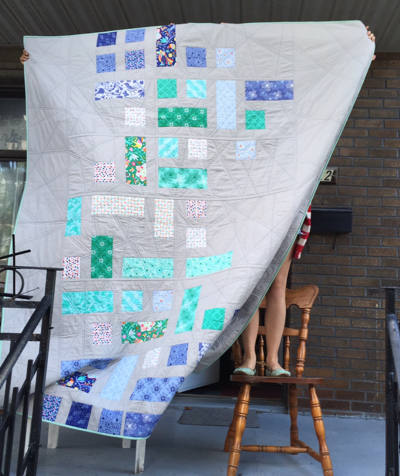 Once all my sections were quilted, I used MR's method to sew them together into a quilt! It was like magic! 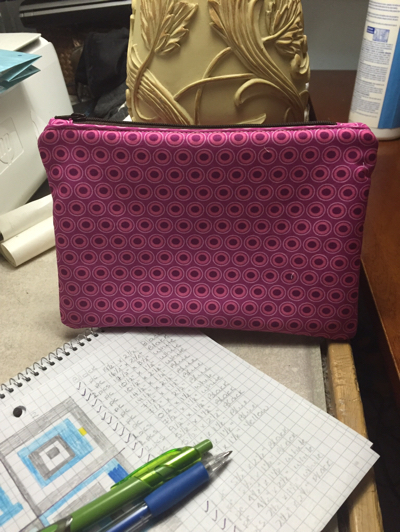 For the binding, I used some Kona Mint I had in my stash. 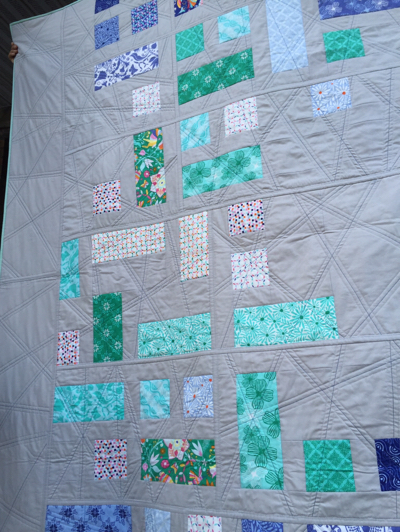 It very closely matches the green in some of the blocks and adds a nice pop of colour at the edge of the quilt. This experiment, I think, was a success! This quilt is now going to the Island House. 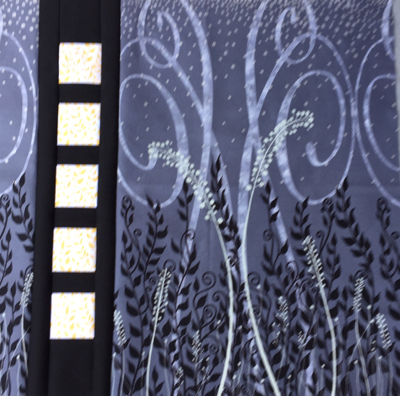 The finished size is 72" x 88", perfect for the twin bed we have in our guest bedroom. 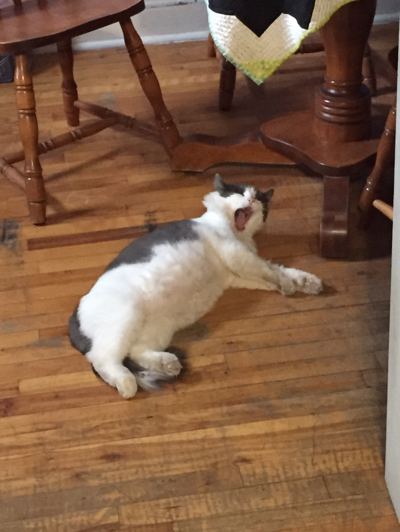 And I leave you with a outtake of the photo shoot we had yesterday. The weather wasn't great so we couldn't go very far from the house and it was super windy! 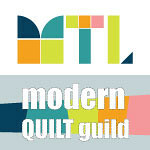 I will be linking up at TGIFF hosted by Laura this week and Crazy Mom Quilts for Finish It Up Friday. I haven't done a WIP post in a while because for the past few weeks, I really only had 1 project on the go and figured it would be pretty boring to post pictures of the same project every week. Well - I finished my big quilt this week (will post pictures of it later) so got started on a couple of small projects: Pillows! My inspiration for these pillows was this Pin. 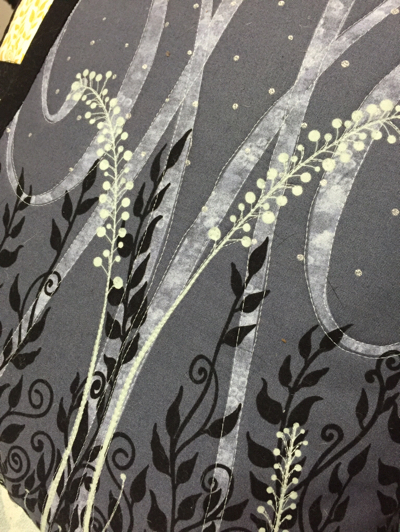 Unfortunately, I don't know what prints these are (if you do, please let me know in the comments), but the solids are Kona Ash and Kona Black. Our new bedroom colour is grey and I haven't quite decided what the accent or splash of colour is going to be, but I think this little bit of yellow will look good. So these are destined for our bed. 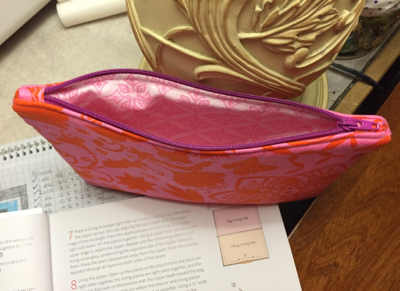 I cut and pieced both pillow tops in one evening, while watching a few episodes of Drop Dead Diva on Netflix. They measure 19 1/2" square right now, but I'm planning some pretty dense quilting on these so they'll probably end up at 18" square. 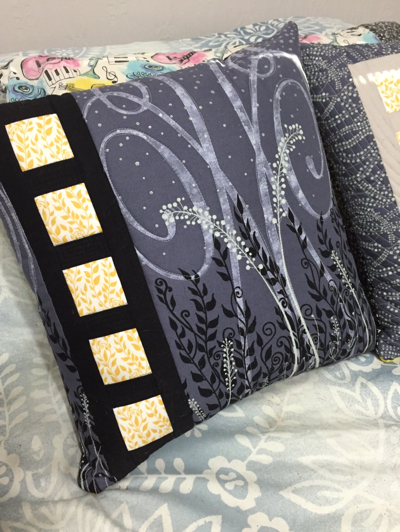 I pinned a few Angela Walters FMQ designs on my Pinterest board so will most probably try a few on these pillows. I purchased some cheap muslin at WalMart today for the backing you won't see inside the pillow so I can get started on the quilting tonight. 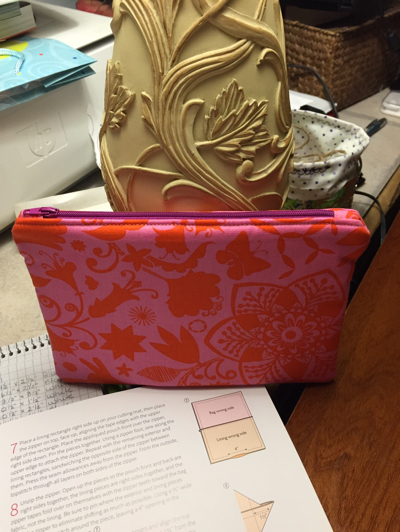 Linking to Lee's for WIP Wednesday.